Just months after signing the Civil Rights Act of 1964, President Lyndon B. Johnson asked Attorney General Nicholas Katzenbach to begin drafting a voting rights bill. Johnson, Dr. Martin Luther King Jr., and other African Americans had discussed a voting rights bill several times before it was ever introduced in Congress. For example, in January 1965, Johnson called King from his Texas ranch and asked King to publicize the worst examples of literacy tests, in order to win public support for voting rights. On March 15, one week after the “Bloody Sunday” assault on peaceful civil rights marchers in Selma, Alabama, President Johnson announced that he would send Congress a voting rights bill. He said, “We have already waited 100 years and more, and the time for waiting is gone…all of us must overcome the crippling legacy of bigotry and injustice, and we shall overcome." 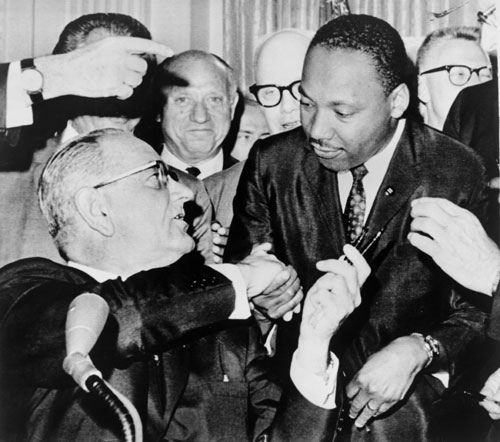 Congress passed the Voting Rights Act and President Johnson signed it on August 6, 1965.